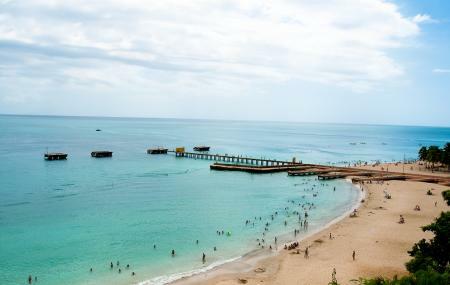 Crash Boat is widely regarded as one of the most popular surfing beaches in Aguadilla, as well as the most photographed owing to the stunning landscape that surrounds it. The beach is not only home to sea shells and a few pieces of driftwood; tourists will also be able to set their sights on fishermen and their old fishing nets. The name of the beach is said to originate from it being used earlier by the United States Air Force. It served as a small port with a pier where boats would dock to rescue downed airplanes. There are a few limestone caves located proximate to the beach, and should be visited. Also, the beach’s claim to fame is the fact that it is a popular place for surfing. In fact, it has won two International Surfing Association championships – in 1968 and 1988. Crash Boat Beach is actually divided into sections - the south section of the beach provides sheltered swimming while the north section offers tourists the chance to indulge in snorkelling. You can also spot a few kayakers in the vicinity. Be sure to equip yourself with the appropriate gear before engaging in water sport activities like snorkelling and kayaking. Follow the instructions of the guides before embarking on adventure sports. Do carry your camera to capture some beautiful shots. The beach provides bathrooms for bathing and personal use. It also provides parking facilities for visitors. You could hire a car from a local transport hiring agency. There are buses which can transport you to the beach. How popular is Crash Boat Beach? People normally club together Wilderness Beach and Punta Borinquen Lighthouse while planning their visit to Crash Boat Beach. Perfect place for scuba diving newbies. Never go alone is not recommended to scuba dive by yourself. 40-60 feet of depth, abandoned ships and a lot of colorful fish. NO sharks or anything crazy in the water. There's no need for a boat ride you can swim from the shore. Beautiful beach, clear water (lots of fish!!) and lots of fun jumping off the pier! Beautiful beach. Water is super clear. Good for scuba diving as well. You need to pay 3.75$ for parking. Be aware that you might need to wait like an hour for the food sold on the beach.